Below you can view all the homes for sale in the Cobblestone Lakes Of Zionsville subdivision located in Zionsville Indiana. Listings in Cobblestone Lakes Of Zionsville are updated daily from data we receive from the Indianapolis multiple listing service. To learn more about any of these homes or to receive custom notifications when a new property is listed for sale in Cobblestone Lakes Of Zionsville, give us a call at 317-987-2530. The fenced yard is situated in a perfect location and a huge wood deck for your relaxation. Don’t miss this one! MLS#21629071. F.C. Tucker Company. Home is close to Zville Rail Trail, all 3 ZCS schools and Mulberry Fields. MLS#21628525. CENTURY 21 Scheetz. 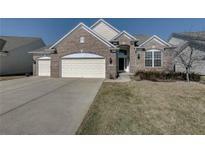 Awesome neighborhood amenities; trail, pool, playground, tennis & basketball & all within walking distance of schools. MLS#21628678. Liberty Real Estate, LLC..
Professional landscaping, 3-car garage. Must see. MLS#21618284. CENTURY 21 Scheetz. See today. This will not disappoint! MLS#21619486. F.C. Tucker Company. Close to the walking trail Walk to club house and swimming pool MLS#21610604. CENTURY 21 Scheetz.